The flora of Emancipation Park ideally captures the legendary beauty of this tropical island surrounded by the deep blue Caribbean Sea. 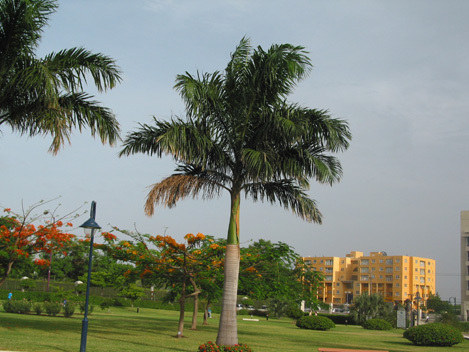 The landscape of the Park includes a wide variety of flowering plants and trees such as the majestic Royal Palm, the Bull Thatch Palm, the National Flower of Jamaica, the Lignum Vitae and the National Tree of Jamaica, the Blue Mahoe. Adding to this picture perfect setting are the Bougainvilleas, Poor Man's Orchid, Poinciana and Poui trees. The colourful array of flowers and trees were chosen to depict the joy of Emancipation. Recently added to the Park's flora are five rose beds with over eight varieties of rose plants for nature lovers to enjoy. Here we showcase a few of the plants and trees that are prominently featured in the Park. 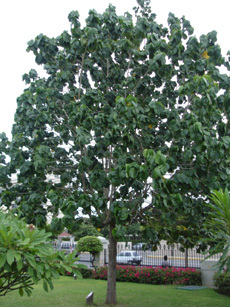 Also known as Cuba Bark, this is the national tree of Jamaica. Its flowers are primrose-coloured in the morning, becoming orange and deep red during the day. The trunk of the Blue Mahoe is highly favoured among furniture makers as the wood is durable and sturdy. The tree's leaves and shoots are sought for medicinal purposes. The leaves measuring on average 15 cm have a heart-shaped base and a dull green surface. This "Tree of Life" is the national flower of Jamaica. It is indigenous to the West Indies as well as North and South America. 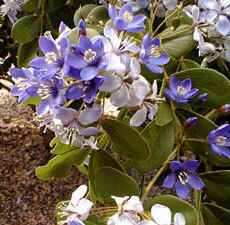 The Lignum Vitae grows to 9m in height with heavy greenish-brown resinous wood. It produces small blue or purple flowers and has dark-green glossy leaflets measuring 5cm that are grouped in two to three pairs. Lignum Vitae is the heaviest and densest wood in the world and will rapidly sink to the bottom when placed in water. The tree's gum is important in producing medicine for arthritis, while the bark is used in the manufacturing of rulers, pulleys, wooden blocks and art carvings. This flowering plant is a common ornamental throughout tropical regions and comes in a variety of colours and species. It is native to India and Sri Lanka. This is a fairly small, bushy shrub, usually only 5-10ft (5m) tall. There are dwarf varieties that are much smaller. 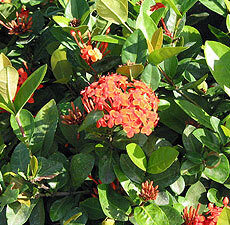 Ixora will flower when only a few inches high. It is commonly used for hedges or as a complement to other flowering plants. Ixora is too tender to grow outside of the tropics and subtropics. It prefers a warm, humid climate with temperatures rarely dipping below 60 degrees fahrenheit, and has only moderate drought tolerance. These plants grow either in the shade or full sunlight. The Lantana plant is a genus of about 150 species of perennial flowering plants, native to tropical regions of the Americas and Africa. The species include both herbaceous plants and shrubs growing to 4ft (2m) tall. 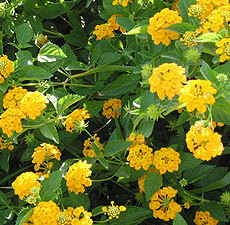 Lantana's aromatic flower clusters are a mix of red and orange florets. Other colours exist as new varieties are being selected. Lantana berries are poisonous. Lantana flowers and berries are attractive to insects and birds. They are widely cultivated for their flowers in tropical and subtropical regions. Some species are invasive, and are considered to be noxious weeds in southern Asia, southern Africa, and Australia. A rose is a flowering shrub of the genus Rosa. There are more than a hundred species of roses. They are mostly from the northern hemisphere and temperate regions. The species form a group of generally thorny shrubs or climbers, and sometimes trailing plants, reaching 2–5 m tall, rarely reaching as high as 20m by climbing over other plants. 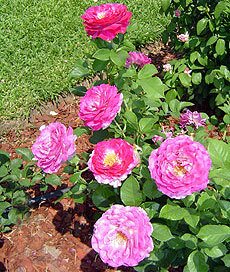 The name rose originates from the Latin word rosa. The leaves of most species are 5–15 cm long. They usually have a serrated margin, and often a few small thorns on the underside of the stem. The flowers are normally used to show expressions of love or sympathy and they need a lot of loving tender care in order to thrive. Known as the Cuban Royal Palm, this is a graceful tree that grows up to 75 ft high (22m) and has a smooth grey trunk swollen above the middle. Leaves of up to 10 feet in length sprout from the top of the crown. This tree is commonly referred to as the Cabbage Palm and grows gracefully into the shape of a fan. It has a stout trunk and can grow between 30 ft (24m) in height. The trunk can either be brown or covered with a criss-cross design of leaf bases. 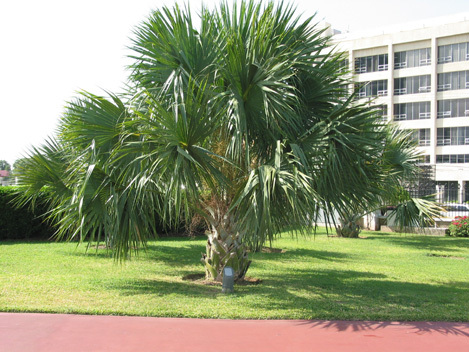 This palm tree has green or bluish leaves, measuring three to six feet wide. It bears black seeds that are not edible. 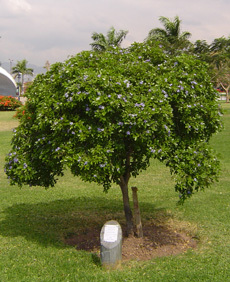 Also known as Orchid Tree, Butterfly Tree and Bull Hoof Tree. It is derived from India and South East Asia and reaches to a height of between 4.6 and 6 metres. It's called Bull Hoof Tree because the leaves are shaped in the form of cloven hooves. Its purple flowers comprise of visible male and female parts that resemble the orchid plant. It normally blooms during October and February. 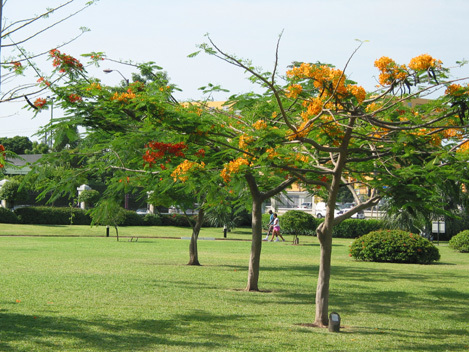 The Poinciana has such rare beauty that it is often mentioned in several Caribbean poems. Also called Flamboyant, Flame Tree and Royal Poinciana, this tree grows to 15 metres in height and comes from Magadascar. It features feather-like leaves and reddish-brown flowers. It ususally blooms between May and July. This beautiful tree comes from the tropical forest of South America and is a sight to behold when in bloom usually during the months of April and June. In Jamaica, when the Poui tree is in bloom, it is usually a signal to show that End-of-Year Examinations are fast approaching and it's time to get serious about studying. Georgeous yellow trumpet-shaped flowers are grouped in large numbers and develop and bloom when the tree is devoid of foliage and leaves.